The debate regarding the fate of Malden’s school custodians has fueled some local trash talk. Should the city outsource? Also, is it about cost cutting or actual poor performance by the school custodial staff? Yes, 28 jobs are on the line. More than half of those jobs belong to Malden residents. Eight belong to residents who live in communities adjacent to Malden with these city employees averaging 16 years of service. 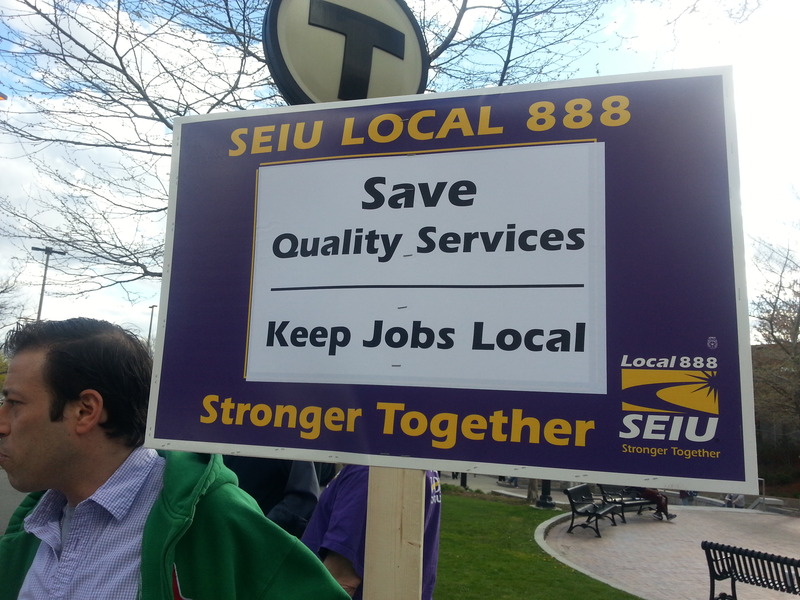 So why is the City of Malden contemplating outsourcing these 28 full-time jobs? At Neighborhood View, we sought to investigate what thinking went into the decision—making process to privatize these custodial jobs, by interviewing the union which represents the custodians and Mayor Gary Christenson for the city. Neighborhood View inquired about how things got to such a critical stage with 28 jobs possibly being loss to private contractors and the union holding a public rally with picket signs and supporters outside Malden City Hall. 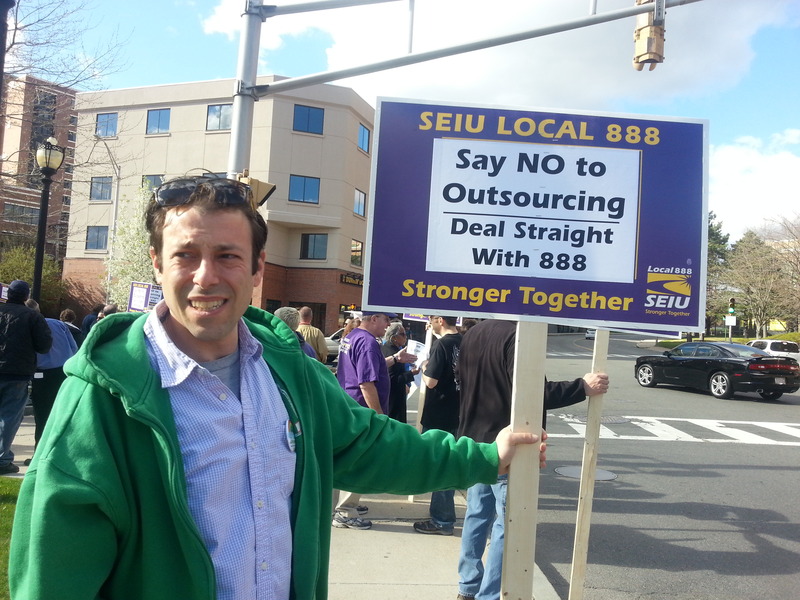 DelloRusso informed us that when he took over as president (of Local 888 SEIU) he was called by Mayor Gary Christenson, who explained that the city had just completed a one-year study by the school department. A lot of the teachers had complained about the conditions of the schools, and at that time a new high school was under construction. At the same time the custodians were entering contract negotiations for a new two years contract. In DelloRusso’s opinion “he (the mayor) had already decided to outsource the cleaning of the new high school and send those workers from that school to the lower level schools.” However he explains Mayor Christenson agreed to sign the new custodian two-year contract, but he made it clear that there had to be a significant improvement in service. Things were left to run their course and see how they would evolve. The Local 888 Union was under the impression that if there were no improvements or changes in the quality of service they would be informed through a supervisor oversight function. Negotiations were supposed to have opened for a new contract by the end of 2013, when this didn’t happen Mark DelloRusso went to sit with the Mayor in February 2014, where he was informed that no new contract would be signed. After seeing a copy of a letter which was addressed “Dear Supporter of Gary Christenson” requesting the reader to either call or email the Mayor and “urge him to save 28 good, local jobs in Malden.” We asked DelloRusso wasn’t this an example of using dirty tactics by going after the supporters of Mayor Christenson? He claimed that the letter didn’t come from his office, and that he wasn’t aware who was contacting the Mayor’s supporters. We have learned that the Malden School Committee has voted to recommend outsourcing the school custodian’s jobs, which now means the matter will go to the City Council to be voted upon. In checking the Fiscal Year 2015 Budget which was submitted by Mayor Christenson to the City Council for their consideration and approval we see that under the School Department’s budget there is a line item for “Facilities Custodians” with an amount of $1,371,295.10 and an asterisk saying “Subject to negotiations.” So it appears that the fate of the 28 Malden School Custodians lies in the hands of the City Council at this time. We can only ask that their deliberations be just and equitable. At the Malden City Council Meeting held on Tuesday June 3, the matter was discussed and it was evident that the entire Council is concerned about saving the jobs of the custodians, but also concerned about the uncleanliness of some schools. A decision was taken to first move the line item and its budget for “Facilities Custodians” from the School Department’s responsibility back to the city under “Public Facilities.” The Council also made it clear that standards had to be applied as well as an oversight performance competence.